If you are teaching nonfiction text features to primary students, Arctic Fox Pups would be a superb choice for helping to introduce glossaries, indexes, inserts, labels, and maps. The subject, arctic foxes, is an engaging one since most students will not have a lot of background knowledge with this animal. Eye-catching photographs show the fox maturing into their adult stage. Students will learn how having white fur and fur on the bottom of their feet helps this fox survive in its Arctic surroundings. 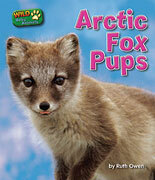 There are also short articles about the arctic fox's habitat, feeding habits, and other aspects of their life as pups. I really like the size (6" x 7") of this book as well. It fits nicely into the hands of a late kindergarten-early first grade student who would be ready to read it independently or with a little scaffolding. I think an older reluctant reader who is beginning to learn about researching might be able to use this book as well. If you want your student to learn research skills, you don't want the content of the book to become a stumbling block. Arctic Fox Pups would also be a good vehicle for introducing graphic organizers such as a Venn diagram or a circle map. This book is one of a series of books on wild baby animals. Other baby animals in the series include polar bears, squirrels, beavers, skunks, lions, raccoons, and tigers. For a look inside this book, click on this link.